Awesome staff, always friendly and willing to help whenever you need. Comfortable rooms, clean bathrooms, superb location. Staff is really engaged with the interaction between all guests, always promoting dinners, pub crawl, walking tours (by the way, the responsible guy for this specific task- if I'm not mistaken, his name is Alberto - is extremely competent!). For 3 euros you can have an "all-you- can- eat" breakfast which is worth paying. Excellent hostel and great value for money. Everything was impecable and the staff is a plus. I'd definitely come back. I had a great stay at Yeah Hostel in March 2019. Stayed with a friend in a 4 bed mixed dorm and it was nice. The beds have a really big locker for the baggage and there is an extra locker near the pillow, with personal light and a power plug. We had breakfast every morning at the hostel, worth it. Security is good, you access the room with a personal magnet key. The location is also really good, there is an entrance for Verdaguer metro station two corners below. It’s possible to walk everywhere. Excelente! Equipe, limpeza, localização, o que oferece aos hospedes. E a segunda vez que me hospedo e se voltar a cidade ficarei lá novamente. So acho que deveriam colocar cortinas nas camas superiores do beliche. My second time in this hostel, I really enjoy staff and the facilities. Very close to the metro station. The only thing not so good is the shower in the dormitories, not a lot of space and it gets wet. Anyway, again it was an amazing experience, definetely will come back. Outstanding hostel! One of the best I've ever stayed at. Great clean hostel with super friendly staff! The room we were was amazing and the atmosphere is also really nice! Worth the price! 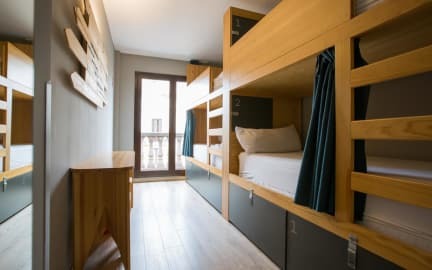 Hostel muito bom, com clima sensacional e muito bem localizado (próximo a Sagrada Família e ao Passeig de Gracia), toda a equipe é muito atenciosa, principalmente Sonia, Laura e Albert. O free walking tour do hostel é muito bom também. Ambiente moderno, proporciona boa interação com os hóspedes, quartos limpos, excelente estrutura, café com ótimo preço, serviços como lavanderia, bar e restaurante! Pessoal bem atencioso e as instalações muito legais. A opção de jantar no valor de 12 euros com bebida e comida liberada foi muito boa!